Doctors Physicians in Las Vegas NV Primary Care Providers and Walk In Clinic in Las Vegas NV. Canyon Medical Center - Board Certified M.D. Call (702)-220-8001. Las Vegas Physicians and Las Vegas Doctors providing exceptional Primary Care in Las Vegas and Walk in Clinic & Medical Clinic services since 2001 in Las Vegas, NV. Doctors in Las Vegas NV providing all Health Care Services in the Medical Clinic and Medical Center, located at Las Vegas NV. Primary Care Doctor, Physician practicing in Las Vegas, since 2001. Canyon Medical Center. Primary care Clinic is located, just OFF FreeWay US 95N. Our Primary care Doctors, accept most insurances, including Medicare and Medicaid. Las Vegas Doctors and Physicians accept Aetna, United HealthCare, Teachers Health Trust, UMR, Teamsters, Beech Street, Culinary, Silver Summit Healthplan, Sierra Choice and Sierra HealthCare, Cigna, Anthem BlueCross BlueShield, Casino insurances, Coventry Health Care, Teamsters Local 14, Teamsters Local 631, Teamsters Local 995, UFCW Local 711, Amerigroup, Direct Care, Nevada Health Co-op; HPN-Medicaid; Union Health, MGM Resorts, Operating engineers Healthcare and Welfare fund and much more. Our Doctors in Las Vegas, Physicians in Las Vegas, practicing in Las Vegas, since 2001. Canyon Medical Center. Las Vegas Urgent Care and Urgent Care Doctors. Physicians accept most insurances, including medicare and medicaid. Las Vegas Doctors and Physicians accept Aetna, United HealthCare, Teachers Health Trust, UMR, Teamsters, Beach Street, Culinary, Silver Summit Healthplan, Sierra Choice and Sierra HealthCare, Nevada Health Co-op; HPN-Medicaid; Cigna, Anthem BlueCross BlueShield, Casino insurances and much more. For non-life threatening urgent care and urgent medical needs, ER is not the solution, given its long wait times and very high expense. Instead Call (702)-220-8001 (or) Walk In to our Urgent Care Clinic & Urgent Care Center, to get immediate relief and our Dr Las Vegas NV, will provide you with excellent care and also follow you with continued medical care as your primary doctors and family doctors. Las Vegas Doctors and Physicians location and proximity to Summerlin, Las Vegas and Centennial Hills Las Vegas region; gives convenience for easy access off the Free Way US 95 N, in the North Las Vegas and Northwest Las Vegas regions. 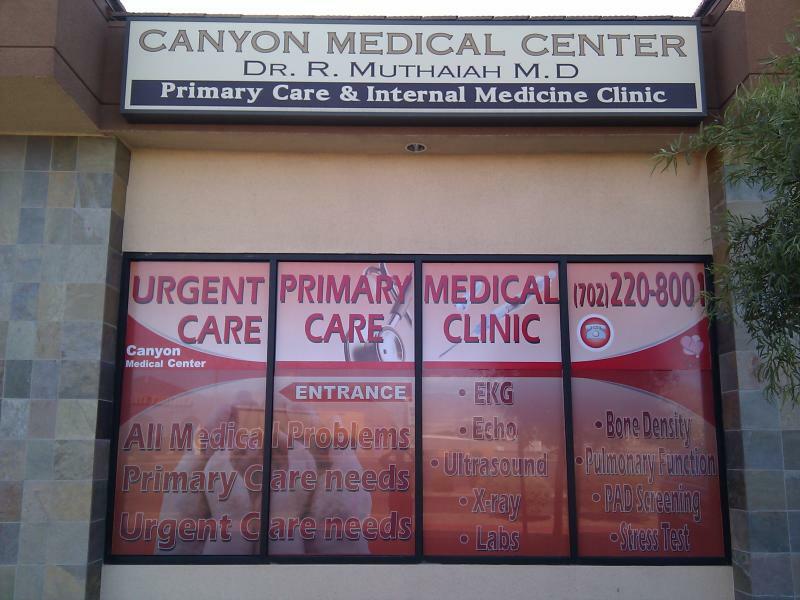 Canyon Medical Center's location is very convenient, and we are the doctors office to go for non- emergency medical conditions and medical care. We are an alternative to hospitals for, non- emergency medical conditions and diseases, similar to the concepts like minute clinic, quickcare, immediate care, walk in clinic, same day clinic, takecare, nextcare. Nevada Doctors in this medical center take most of the health insurance in las vegas and for uninsured patients, we have different levels of medical cash plans to meet your needs. Completed his residency in Internal Medicine from George Washington Universtiy, Washington D.C.
Doctors / Physicians Practicing in Las Vegas area since 2001. Canyon Medical Center has been providing exceptional services with Urgent Care Primary Care and Medical Care Services in Las Vegas NV. Quick Care, Immediate Care, Primary Care, Complete Medical Care and Emergency Care medical services provided by Board Certified M.D. Doctor, who is practicing in Las Vegas since 2001. For Life Threatening Medical Emergency, Call 911 & go to the nearest Hospital. For non-life threatening medical emergency, you don't have to go to Emergency Room and wait for hours at the hospital emergency care facility; to be seen. Instead come to our walk in clinic to be seen immediately. Our doctors in las vegas are Board Certified MD's. Our Medical Clinic / Urgent Care Locations is just OFF the FreeWay on US95 N - opposite Santa Fe Station Casino. Extended Hours & Walk in Medical Clinic - Open Extended Hours & Weekends. Come see our Dr las vegas nevada. Our service areas include, Las Vegas Nevada, North Las Vegas Nevada, NorthWest Las Vegas Nevada, Summerlin Las Vegas Nevada, Henderson Nevada, Centennial Hills Las Vegas Nevada and surrounding Las Vegas Metropolitan regions. MOST INSURANCES AND CASH PLAN ACCEPTED. WALK-INS WELCOME. NEW PATIENTS WELCOME. APPOINTMENTS ARE ARRANGED IN SHORT TIME.